13.7 million people in the United States are currently unemployed. This number is unreal but did you know that if you are one of the unemployed that you can file an unemployment extension that will allow you to collect unemployment pay up to 99 weeks? Sure, it's a controversial subject but if you're one of the ones that are unemployed you might want to definitely take it under consideration. The site where you can get help is non-profit informational based website that is widely used as a point of reference for individuals looking for unemployment trends and current legislation benefits that you are entitled to. Most importantly, you can file your unemployment extension with step-by-step instruction and help when you go to http://www.unemployment-extension.org. Don't wait till you're in dire circumstances to file for your unemployment extension. We got a programmable slow cooker for Christmas and really enjoy using it. While we don't set it and leave it unattended like some people do, we do like being able to just forget about dinner till it's ready. If you're looking for the best value programmable slow cookers you might want to check out this site I found. There are tons of programmable slow cookers for you to look at and make a decision on which is best for you. There are some really neat ones there like the West Bend Oblong Shaped Slow Cooker with Tote. While I love ours, there are tons to look at and some awesome deals as well. Most are eligible for free shipping and it's always good to save a few dollars. Check out all of the slow cookers and make cooking easier on yourself. My coupon portfolio, that is. 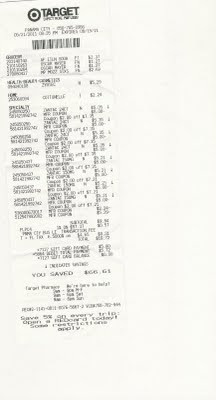 We had gone to Target and Winn Dixie on Wednesday and I'd taken it with me. I used coupons both places and didn't notice till tonight that it seemed to be missing. I looked everywhere and couldn't find it. I'd asked Rich if he remembered putting it in the truck but he couldn't. We finally called Winn Dixie where we'd shopped last but the guy I talked to said no one had turned it in. Tonight we had to stop by there and pick up a couple of things and I thought I'd ask the manager there if he'd seen it. Turns out it was lost on Wednesday but he found it in a cart last night. I can't believe it's still there. This is no ordinary binder. It's an expensive leather thing with my business name engraved on it. I got it back in 2009 I think and was going to use it as a portfolio but never did because the pages aren't big enough to print correctly. Anyway, it's back in my hands, safe and sound. Rich is also out of the doghouse; his quote not mine. I've talked about Blue Sky Scrubs in the past but seriously, check out these hot pink scrubs they have. Those are gorgeous. If you work in the medical industry you can't go wrong with the product line anyway since they are of the utmost quality. My point is, you get gorgeous scrubs like the koi scrubs on sale or just about anything you need to wear in a doctor's office or even the ER. You all know how I'm all about home security. If you're looking for home security Arkadelphia area companies then you should really check these guys out. Right now they have a great deal where you get a complete security system for just $99 installed. You get 24 hour ADT monitoring and best of all, peace of mind. In fact, you can have LocalTV-Satellite and still get your own monitoring system. It's been one of the things that really gives me more peace of mind. We're not in some high crime area but you can't be too safe nowadays with the amount of social networking and ways that people can find out when you're not home. Why not get the security you and your family needs and feel safer at your own home? I was recently fortunate enough to get to check out an eBook called Make Money Online: How I Created a Six Figure Income Giving Away a Dead Guy's Book. This is by a gentleman by the name of Vic Johnson and if you haven't heard of him just simply do a Google or Bing search; he's on the top of the charts! His book teaches you how to make money online and can't we all use a little of that? If you have need any type of presence on the web and want to make money on top of it, you'll get this eBook. In fact, even if you're new to the world of trying to make some cash on the Internet you need a guide and this is the guide for you. His eBook even has a positive review from the guy that is the best selling author of The Secret. That alone was impressive to me because I've read The Secret. Check it out. It's affordable but the information is priceless! Tonight I got 8 packs of Zantac. $7.35 to start with. My total bill for all that and a couple of extra items was over $77. I had a $5 gift card from other coupons, free Cottonelle and Zyrtec coupons and $7 off of Zantac. My bill was $10.72 and I saved $66.61. I would have saved even more but we had the wrong lunchables coupon. We did good though. 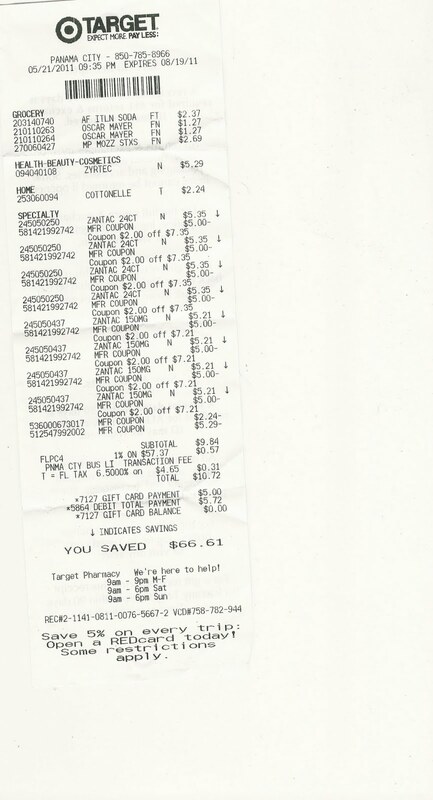 Here is proof with our receipt. I think you can click it to view the full size. I’m all about saving money lately and one way you can save money is to buy your own OEM Car Parts and have your mechanic use them or if you’re like us, do it yourself. I don’t know how many times Rich has bought his own parts and done our own repairs. It sure saves time and money. Heck, we all know how high it is to go to the dealer and have them do a repair for you. Between the parts and labor you could almost buy a new car by the time you are done dealing with them. When you buy your own OEM Auto Parts you get the real price, not the price after the dealership has marked it up. Most places will allow you to buy your own parts and let them use them. It saves everyone a lot of money and since the mechanic isn’t out any extra money, typically they don’t mind. In fact, be aware that if your mechanic won’t let you buy your own parts you may be paying more than you should. This can be due to them marking up the price parts. We’ve even had it happen to us but luckily we caught it. I have really gotten some great deals lately from couponing. I haven't done any of the food couponing because we don't have a deep freeze. We have a large refrigerator but you'd be surprised at how fast it fills up; or perhaps you wouldn't be. Mostly I have HBA stuff like Ibuprofen, peroxide, toothpaste, deodorant, lotion, shampoo and body wash. Oh and razors! I have some other stuff like cleaning products but those are the main things in my stash. However, most of it was free or under 50 cents. All of the Ibuprofen was free and all of my Zantac boxes were about 34 cents. It's fun and I enjoy it so it's kind of cool to have a hobby that saves money. I was online not too long ago and happened to come across some real estate related cheap domain namesup for purchase. I jumped on them, and now I’m so glad I did! I’ve since developed a new marketing strategy that includes creating a website for each and every home I list, which is pretty labor intensive. It’s great, though, in that potential buyers have a one stop shop to find out information on my properties so I’m not constantly inundated with basic informational phone calls. My clients also seem to like this feature and all beg me to keep the! photos updated on their sites. I secretly suspect that many of them just like showing off their webpages to their friends and families! I’m still learning what it takes to be a good agent and I’ve decided that the more involved you can get with your clients, the better. Obviously some require more attention than others but having the home websites really shows everyone that I’m in it to sell their house and willing to work hard for it! We’re lucky that before we bought our home our landlord put on a new roof after a major hurricane, Hurricane Opal. However, a lot of people in our neighborhood haven’t been so lucky and have had to look for a roof repair company at the slightest gust of wind. I sure am thankful for our new roof because it hasn’t even had a loose shingle in the years since. This is a Sponsored post written by me on behalf of Nutrish for SocialSpark. All opinions are 100% mine. I was recently lucky enough to get to sample Rachael Ray Nutrish just 6 dry dog food or I should have said that my dogs were lucky enough! Let me tell you that my dogs were excited before I even opened up the bag. Once I poured it for them they immediately gobbled it up! I poured the twins some first and then gave Swan the rest and well, it's all gone on the twins' behalf. As many of you know, Swan is a picky eater and as I type this she is chomping away at the food. They loved the Nutrish dog food and that's pretty exciting because it's actually good for them. Rachael Ray Nutrish just 6 dry dog food comes with just 6 ingredients: rice flour, barley, beef, oat fiber, olive oil and malted barley flour. Obviously if you get chicken or lamb instead then instead of beef you get those proteins. 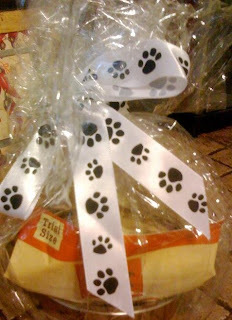 They also come in either soft and chewy or crunchy textures so you can pick the one your dog likes best. Right now they are giving away a free sample and you can let your dog try it too! If you're like me and consider your dogs a member of the family then you'll want to give them the best - Nutrish.